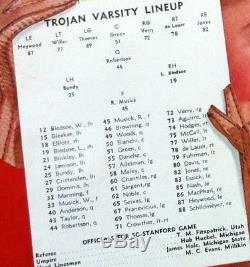 Jones was an end and kicker for the Trojans and part of the 1939 team that USC claims as the National Champion. Of Southern California football memorabilia... The great Trojan football heritage. 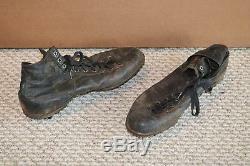 Football shoes; I wore those during my sophomore year, 1939, when we went undefeated and were named National Champions. We beat Notre Dame 20-12 at South Bend. Wearing these shoes, I kicked our two extra points. 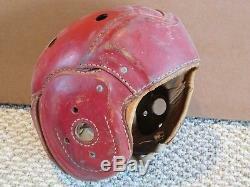 Football Helmet: during the 1940 season I suffered a concussion. For 1941 the medics supervised fabrication of my helmet, which you know own. My number 32 was changed to 82 since a played right end. 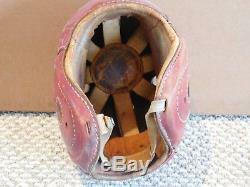 The cleats were made by Riddell, appear to be leather, and are in excellent condition. 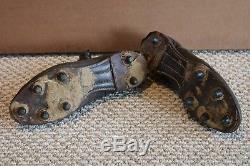 There is even old mud still stuck to the cleats. 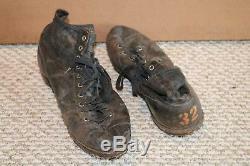 Jones' #32 is stamped on the back of each shoe. 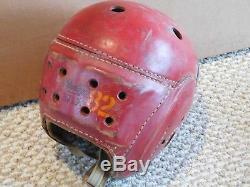 The helmet is red and is a Rawlings composite suspension type helmet. There is a hard shell stitched to leather inside and out. The chinstrap is still attached. 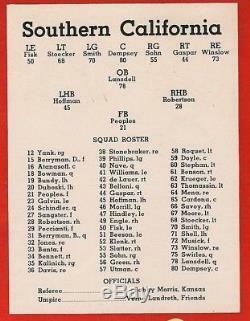 I have included images of a 1939 and a 1941 roster page from a USC program that verify that Jones wore #32 in 1939 and #82 (as a starter) in 1941. Both items guaranteed to be authentic and original. The item "1939, 1941 USC Southern Cal Trojans game used helmet & cleats lot from Bob Jones" is in sale since Tuesday, February 27, 2018. This item is in the category "Sports Mem, Cards & Fan Shop\Game Used Memorabilia\College-NCAA". The seller is "fbandmore" and is located in Allen, Texas. This item can be shipped to United States.